Rhubarb is the edible stalk portion of the Rhubarb plant. Stringy and tough, the stalks range in colors of light pink to deep ruby red. The texture of Rhubarb is often compared to that of celery stalks, while the flavor is much more tart and requires sweetening to be palatable. Rhubarb is traditionally cultivated in two ways, field or hothouse grown. 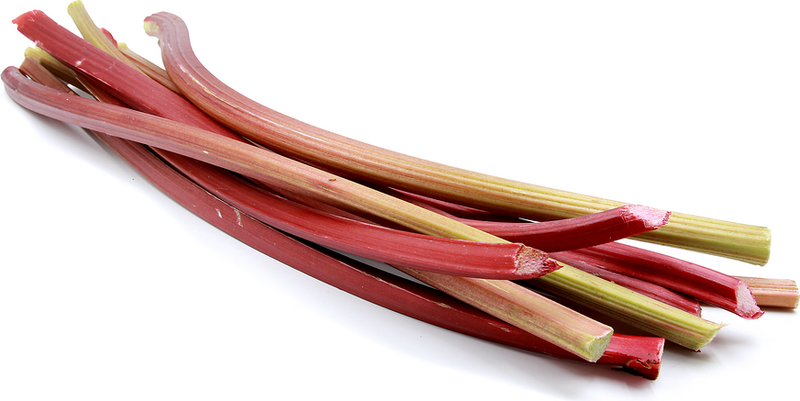 The field-grown Rhubarb has attractive dark red stalks and green leaves while the hothouse-grown Rhubarb produces pink or light red stalks with yellow leaves. Hothouse Rhubarb is milder in flavor and less stringy. The Rhubarb plant consists of a base, called a crown, that rests at soil level and roots down. From the soil line multiple stalks shoot out with brightly colored, edible stems that are tipped off with large, deep green leaves, leaving the plant with a rounded, bush type appearance. The roots and leaves should not be eaten as they are poisonous. Rhubarb is available from early spring through fall. Rhubarb, botanically known as Rheum rhabarbarum, was primarily used for medicinal purposes until the 1800's. There are over 100 different species of Rhubarb, most of which are hybrids, and some of which are strictly ornamental. Rhubarb has been used for medicinal purposes, including as a potent laxative, for thousands of years. The leaves of the Rhubarb plant are fatally toxic, although the exact compound behind the toxicity is unknown.